Here they are! 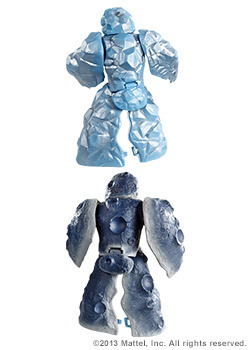 Mattycollector.com just posted these a short while ago. While many fans have speculated that these guys would be the Masters of the Universe Classics exclusives for SDCC this year, it's nice to finally have official confirmation. 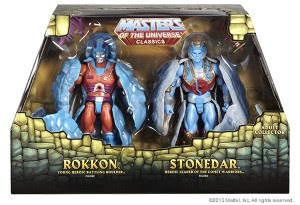 No word yet if their will be a packaging difference between figures sold directly as SDCC and those sold on Mattycollector after the convention, so hopefully we'll hear something soon. 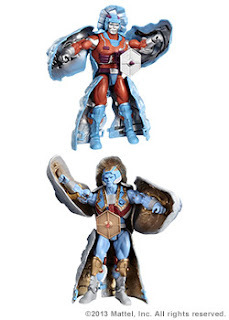 While I'm not a huge fan of the Rock People, I am glad to get these guys; after we have them, we'll only have four heroic warriors in need of an update from the vintage line (Rio Blast, Extendar, Gwildor, and Rotar). More speculation, commentary, and pictures after the break..
Rokkon and Stonedar both match their vintage counterparts quite nicely, but look to have much better detail. In this picture, we can see that leg and arm rock armor panels are removable, which should allow for much better articulation. The original figures just kind of stood around. Here we can see the arm and leg panels attached and more excitingly, the laser gun attached to the chests. The vintage figures could hold the guns in their hands or in their chest, so it's great to see the feature replicated. 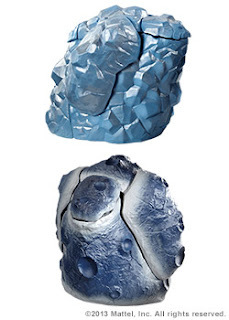 Shots of the figures from the rear, allowing us to see the really cool details on the surface of the rock armor. 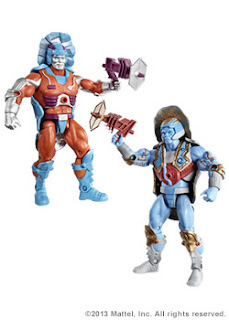 I really didn't believe that Mattel would actually pull off making these guys fold up, but they did. It looks great and provides another display option for these guys.